Self-propelled machines and their potential uses in the Army were of special interest to military forces from early on. 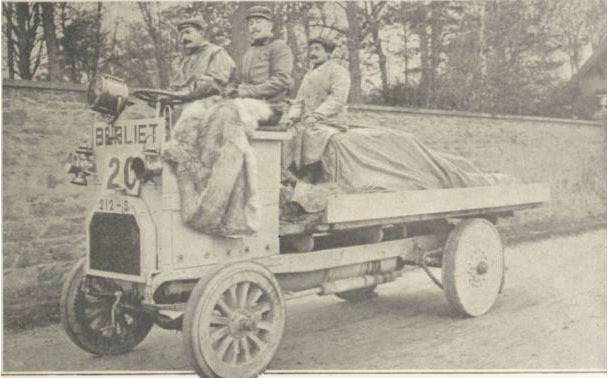 Road transport for logistics purposes was gain strategic importance in the First World War. The ACF (Automobile Club of France) organised army vehicle competitions to evaluate the performance of the different types of competing vehicles. Un camion Berliet, 22 cv, 5 tonnes, vitesse 16 km/h. On 19 November 1906, 19 trucks departed on a round-trip from Paris to Marseille. Three weeks later, only 12 of them managed to reach the Tuileries, where prizes were awarded to the winners. According to an observer at the time, "There is nothing to replace or equal steam when it comes to heavy vehicles". What did the competition demonstrate? "The heavy vehicle is truly a practical car. A speed of 12 to 15 kph should be considered sufficient. Let us be sensible and go no further." "La vie au grand air" (French sports magazine), 15 December 1906.